Love is a wonderful feeling, isn't it? That rush of emotions, those fluttering butterflies and the sprinkle of pixie dust, it is miraculous indeed. Love makes you crazy and it makes you do crazy things. Like sit up all night and chat with your lover, or pick up new habits that your lover likes and so on. I do believe that love happens more than once, but when the right person comes along that kinda love stays. Forever. It is not easy to remain in love forever. When the rush of feelings subside and the butterflies decide to rest for a while, reality strikes and you realize that holding on to a relationship is much more than fluff. It takes a lot of hard work, patience, mutual respect and trust to keep a relationship going. And time. It is very important to focus on spending a lot of time together. A lot, but not all the time. 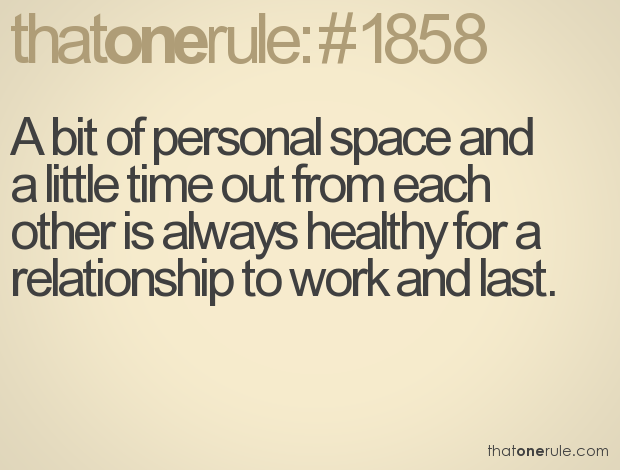 One of the most common misconceptions in a relationship is that everything needs to be done together. That is not called togetherness, it is called smothering. While it is lovely when couples spend a lot of time together, but if they are together all the time it can be frustrating. Couples should also spend time away from each other and do things that they love doing. While it is important to take an interest in your partners hobbies and hang around them, you need not do this all the time. While spending time together is important, spending time away is also equally important. Most couples have similar interests and a common group of friends. But it is also important to pursue individual interests and spend some time with your own friends. I love reading and would like to spend some free time cuddled in bed with a book. My husband is more of an outdoorsy person and he prefers going out for a game of badminton or running. I am too, but I do enjoy reading more. Some times we both go out and run or play or we both stay home reading and some times he goes out to run and I stay at home with a book. This way both of us get to do what we want to do and both of us are happy. As much as you need love and respect in a relationship, you also need space. Two individuals come together to create a new life but their individual lives must not be forgotten. Once in a while he goes out with his friends and I do the same too. Spending time away from your partner doesn't mean that you are bitching about your partner or cribbing about your married/committed life. It just means that you enjoy some time away from each other too. This is totally normal and absolutely vital. Honestly, not everyone gets this. If your husband/wife is away for a drink with their friends it doesn't mean that they do not love you or do not want to have fun with you. Every person deserves a break from another. Be it friends or couples. I am a sucker for me time and whenever my husband goes out, I end up doing a lot of stuff that I love. Not that I cannot do it when he's around, but there are a few things that I cherish when I'm alone like sketching, stitching or just reading. When I go out to meet my friends, he ends up doing things he loves too. In this way, both of us are doing things we love and having fun. This also makes us cherish those moments that we spend together much better. Yes, love is a wonderful feeling. But one must not lose themselves in it. As much as love is about "We" it is also about "You" and "Me". This is not called being selfish. This is called being sensible. When "You" and "Me" are happy, so is "We". I totally agree with you. We all need personal space and should respect each other's space too, specially when both the partners have different personalities. Else living together might get very difficult. Totally agree and that's my definition of love too. We have moments at home when I am reading and VT is watching a movie. It's okay to have diverse interests and respect each others' choices. Bang on! That is what love should all be about. Absolutely. Love isn't all idealistic and "gooey" that songs make it out to be. Real love is more like this. I've known couples who completely cut off their friends, and when the relationship ends (and such relationships do often end, cos there's nothing nurturing it), they don't know where or whom to turn. I've see such couples too and also the struggles that follow the break up. Not a good sight at all. Live and let live always works. I am completely with you on this one. The husband and I have so many different hobbies and activities and sets of friends to go out with. I think it gets suffocating if you are always together. We need that separation, that time with ourselves or with things we enjoy to keep the marriage happy. Suffocating is the word and no relationship should be claustrophobic.